This 80mm scope retails at just £269, including a 20-60x zoom eyepiece. If it’s any good, that makes this package a bit of a bargain. ‘Avian’ is the brand name of Ace Optics, a Bath-based retailer. 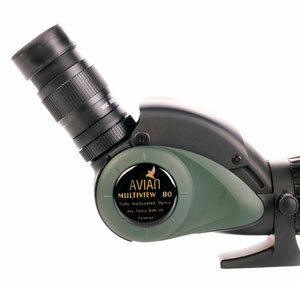 Avian binoculars have been around for about a decade and have been very favourably reviewed. This Taiwanese-made scope is the first to bear the Avian name and it’s a scope with a difference – the eyepiece can be moved through 90 degrees from straight through viewing to vertical and can be locked in any position along the way. The idea is that this increases the scope’s versatility – making it easier for people of different heights to share the scope, for example. The Avian’s build quality impressed me – it seemed to be a solid, well-made scope, especially when you consider its price. It has more moving parts than the average scope, but all of them worked well. The objective lens is set back about 2.5cm into the scope’s body, which provides a lot of protection to the big front lens. There’s a pull-out lens hood and a rotating collar for mounting the scope on a tripod. The collar isn’t click-stopped, but isn’t too loose and works well enough. The eyepiece attaches via a screw-in collar and has a smooth and pleasantly heavy zoom movement. The view feels narrow, but actually compares reasonably well with other zoom eyepieces – and there’s a 30x eyepiece on the way which could provide a very different experience. The view it provides may surprise you – remember that you can pay this much just for an eyepiece! At low magnifications, central sharpness, brightness and contrast are very good. As you pump up the magnification the scope continues to perform well. At the highest magnifications, the image isn’t as crisp, is noticeably duller and careful focussing is required, but this is to be expected and in good conditions I was impressed with what this eyepiece could do, delivering a functional image even at 60x. Focussing precision is good and I found no major colour fringing. There is a slight blue colour cast, but it didn’t bother me. What of that variable eyepiece? You might think the movement would be sloppy and poorly engineered, but think again. The mechanics are good and it really does give you a more versatile bit of kit. For me, there was too little eye relief at low magnifications and some careful eye positioning was required. At 20x there was noticeable softness at the edges of the view too, but this seemed less of an issue at higher magnifications.This scope is big and heavy, but that isn’t an issue for everyone. It’s not nitrogen-filled or waterproof (it’s described as ‘shower resistant’), and the metal body can get very cold, but a stay-on case is available which solves these ‘problems’. If there’s a MkII, some click-stops in the twist-up eyecup, a bit more eye relief and a wider focussing wheel would be good additions. To nit-pick, the quoted close-focus seemed a little ambitious: for me it was more like 9 or 10 metres; and the screw-on objective cover is fiddly to get on and off. But don’t forget – this is a scope that costs less than £300 – at this price its performance is commendable. RRP: £269 including the zoom lens. Warranty: Fully guaranteed for 1 year. Also supplied: Metal case with foam insert. Objective and eyepiece lens covers.